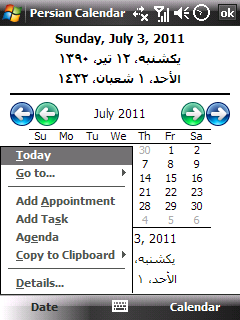 This program is a Gregorian, Persian and Hijri calendar and date convertor with a Today screen item. It can calculate Hijri date according to your time zone. By this program you can define some details for a certain day and mark it as special day in each of 3 calendar types, and it will be repeated every year. 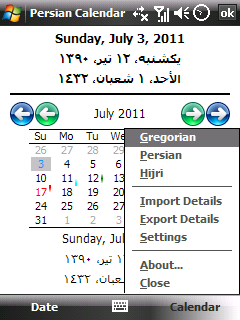 I made a date details file for Iran holidays, you can import it after installing the program. You can also add appointments and tasks to Windows Calendar and Windows Tasks using this program; in this way you will not need to convert dates and the program will do all the work. 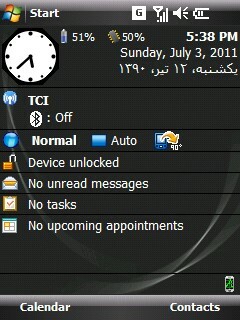 On the Today screen item you can find an analog clock face, a digital clock, used RAM percentage, battery percentage, alarms notification and today date in three calendars (You can make dates that you don't want to see on Today, invisible.) This program also has the ability to copy dates to the clipboard.